Don’t like paying toll roads and toll bridges when you’re driving around? Now you can choose a setting in the Apple Maps app for iOS to avoid tolls when you get directions on Maps for iPhone or iPad. This little-known setting will tweak the directions provided by the Maps app to specifically attempt to avoid toll roads and toll bridges whenever possible. Of course this means you may have a longer commute or distance to travel, but at least you’d avoid paying those pesky tolls! 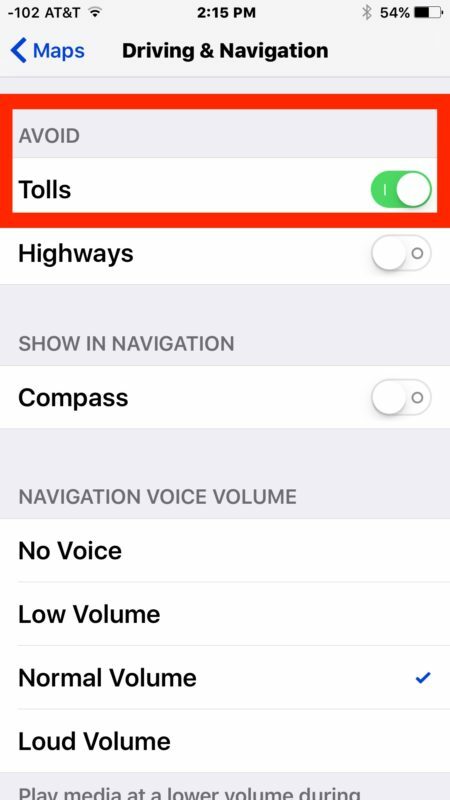 In my testing the avoid tolls toggle effectively skipped a toll bridge, but it’s possible that a toll road or toll bridge may slip through in some areas, depending on if you start adding in stops for gas and food, your destination, and on how large the data set is that Apple Maps is relying on. Whether you’re opposed to paying tolls for bridges and roads out of principle or because you don’t have the money for them, the feature is pretty effective at avoiding them for whatever your intended reason. This is likely most useful for iPhone users, but it works the same on iPad too. This setting should probably included in the Maps app itself so that it could be used on a per-directions basis rather than in the iOS Settings, but for now it’s in the Settings app that you’ll have to turn off and turn on as needed. Heads up to MacTrast for the handy tip. Good tip thanks. Does google maps have toll road avoidance too? I had a friend that has passed away recently that didn’t like expressways. He would always take the longer route just so he didn’t have to get on an expressway. HYe had an IPHONE sop he would have loved this feature. Well, that is just stupid to not like expressways. I bought a new Tesla because I don’t like paying fuel taxes. Though I agree, it is a much better icon than the crap that Apple ships on iOS. This feature is also available right within the Maps app; after you select your destination and the possible routes show up, just pull up on the available routes that it shows (kind of like you can pull up the Control Centre from iOS), and at the bottom of all route options it’ll show “Driving Options.” Select it, and you can also toggle between those two options (avoiding tolls and avoiding highways) without ever leaving the app in the first place. After you’re done with toggling your desired settings, Maps will automatically recalculate the available roads, if any, that satisfy your driving options. It isn’t a per-trip (one-time) setting, since it remembers the last choice you made for it, but works exactly the same as the option under Settings would do.